Today is the 204 anniversary of the Battle of Chippewa. 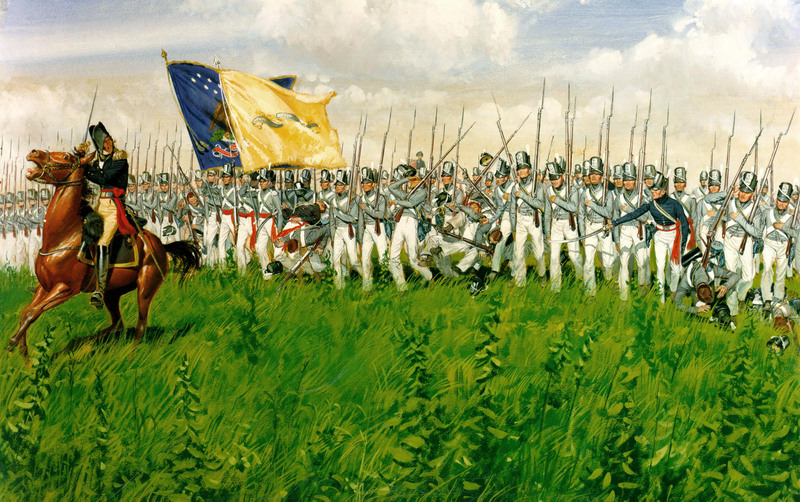 Although minor in terms of numbers the Battle is important in the rebuilding of the American army during the War of 1812. General Winfield Scott 's highly trained brigade is able to stand toe to toe with British regulars. The brigades gray jackets becomes the stuff of legend in the history of the American regular army. "Those are regulars, by God." Maybe not true but a fun quote. 23rdFusilier – Thanks for the reminder! I have enjoyed your work on your blog, enough so that I will be looking for War of 1812 figures at Historicon (I hope some one will be carrying the Knuckleduster line), although British Napoleonic uniforms are a bit daunting for a 15mm WW2 guy. Thanks for posting. A great battle to game as both sides were roughly equal. Our group has played it twice. @panzerCDR; I believe Phalanx Consortium is carrying some KD War of 1812 (one of my war-gaming buddies is picking up a KD order for me from Chris at Phalanx). Also; from Forrest at KD "Also, Covert Intervention will probably have some of Sgt. Major's leftovers. The only thing they wouldn't have are the artillery and limbers." BTW if you send en email to Forrest, he can see that an order is sent for pick up at Historicon…I think there is still time. IronDuke596: Thanks for the information. I'll contact Knuckleduster and see if we can arrange a rendezvous/pickup. No joke, I have a bequest to Parks Canada in my will. They've done a curious US tourist proud many times! When my family and I were in Canada two summers ago my son and I went to Lundy's Lane, Chippawa, and Fort Erie. Parks Canada is impressive and they do an excellent job. you should be able to get the Knuckleduster figures at Historicon. I talked with the booth who is taking over from Sergeant Major at Cold Wars. He had lots of Knuckleduster western figures but no 1812. When I asked he he said I waste third person that day to ask and yes he would have them by historicon. This week I will be going to a wedding up by Buffalo New York and we have a day set aside to visit Chippewa, Lundy's Lane and Queenstown Heights. Fort Erie and George are mabey. Fort Erie is really worth the visit. 23rdFusilier – Thanks. I'll look for them at the convention. I used to live near Buffalo in my youth and got to go to Fort Erie. It was fun. I have driven by the exit to Lundy's Lane several times and wondered what road it was! Maybe next time. Have fun. I have driven by the exit to Lundy's Lane several times and wondered what road it was! Yep, you probably did. Lundy's Lane (R.D. #20) doesn't cross the QEW highway. Coming from Fort Erie you get to the McLeod Rd exit before or Niagara Veterans Highway exit after Lundy's Lane. Now I could be wrong but isn't Chippewa on private property? Chippawa was on private property but it is now part of Parks Canada. And a beautiful site it is. We went to a wedding in the Buffalo area this week and I got a full day to visit Chippawa, Lundy's Lane and Queenston Heights. Great fun, very rewarding and I will be posting pictures and a report on my blog once home.